I met an old meteorology buddy in Chicago last weekend, now teaching after being laid off from a major airline. "I still love the weather but is it a good business?" he asked. We are drowning in weather. Apps, TV, radio, print, social media, thousands of web sites with weather-on-demand. How can you create enough value to carve out a sustainable business model? Every business is being disrupted by the Internet, automation, computerization, globalization and even AI - and meteorology is no exception. Computers have outsourced people, in many cases. And nobody wants to be in a commodity business, with hundreds or thousands of competitors, all selling the same product. We've been hypnotized by technology; the real art is a (consistently) accurate forecast that keeps people safer, and companies more profitable. Today is the wettest day of the week as a front pushes east. Skies clear tomorrow, leaving us with a stunning Thursday. T-storms late Friday mark the leading edge of cooler, Canadian air next weekend; 60-degree highs possible early next week. This free A/C gives way to another surge of summer-like 80s by the latter half of next week. A Plan B Tuesday. The risk of showers and T-storms is high today, probably the wettest day of the week. A few hours of showers and (heavy) T-storms are likely; 4 KM NAM guidance prints out the heaviest amounts north and east of the MSP metro, where some 2-3" amounts are predicted. The 00z 12 KM NAM guidance shows 46" of rain for the metro, but as is usually the case with convective fronts rainfall amounts will be all over the map. Rainfall guidance: NOAA and AerisWeather. Canadian Aftertaste. Some are already complaining about the heat and humidity, and if you don't like the muggies you'll be breathing a lot easier by next weekend with highs in the 70s and a noticeable dip in dew point. Friday looks like the warmest day this week with some low 80s nearby. ECMWF guidance: WeatherBell. Warming Up By Mid-June. After a relatively cool and comfortable start to June long-range GFS guidance shows the core of the jet lifting north, allowing warmer, stickier air to expand northward. A few 80s by mid-June? Likely, but I don't see any extended stretches of 90s, not yet. 6 Dead in Texas Floods, And More Rain is Coming. Here's an update on the incessant rains afflicting much of Texas from the New York Times: "..Since Wednesday, the thunderstorms have dropped pockets of intensely heavy rain, or “rain bombs,” as meteorologists call them. These have circulated through East Texas, Dallas and Corpus Christi, along with Austin and San Antonio, hitting some parts harder than others, said Kurt Van Speybroeck, a National Weather Service meteorologist. As a result, rainfall has ranged from four inches in parts of the Dallas-Fort Worth area to 30 inches in Washington County, the authorities said..."
Photo credit above: "The three men in the foreground had to abandon their truck Friday after getting caught in rising flood waters in Magnolia, Tex." Credit Michael Ciaglo/Houston Chronicle, via Associated Press. Tornado Town USA. What is it about large, violent tornadoes and the Oklahoma City suburb of Moore? FiveThirtyEight takes a hard look - here's a snippet: "...Nobody knows how likely it is that a given town would be hit by four violent tornadoes in 16 years; if we knew that, then we’d also know whether Moore really is especially tornado prone, or just suffering a streak of bad luck. But we do know big tornadoes, themselves, are rare. Devastating EF4s made up 1.37 percent of all the tornadoes that hit the U.S. from 1994 to 2012.2 Just 0.14 percent were incredible EF5s. And that’s enough to make Moore’s recent history turn heads..."
Tornado Sirens, An Old Technology, Still Playing a Vital Role. Remember that sirens were created for outdoor alerting - just don't rely on them when you're in the house, office or shop. Here's a clip from a New York Times article: "...For out-of-the-way places, such as golf courses, lakes and hiking trails, where cellphone service might be spotty or nonexistent, sirens are an “important redundancy” to alert the public, said Bill Bunting, the chief of forecast operations at the Storm Prediction Center in Norman, Okla. Mr. Shelts said social media can be ineffective in delivering warnings because there is no true management or vetting of what gets posted. Incomplete, inaccurate or outdated information could be shared..."
Photo credit: "Most sirens emit sounds between 400 and 600 hertz, which researchers have found is the best range to get people’s attention." Credit Rogelio V. Solis/Associated Press. Serious Hail. My father, who speaks fluent German, sent me a link from tagesschau.de from a town near Frankfurt, Germany, which was buried under enough hail over the weekend to bring out the plows. Deadly Flooding in Southern Germany. The Houston, Texas area isn't the only spot seeing repeated, torrential rains. Deutsche Welle has details on recent flash flooding. Abrupt Atlantic Ocean Changes May Have Been Natural. Here's an excerpt from Climate Central: "...Climate change may not have been to blame for an abrupt recent slowdown of a sweeping Atlantic Ocean current, a change that delivered an intense pulse of ocean warming and sea level rise through the Gulf of Maine and elsewhere along the East Coast. Modeling-based analysis by British scientists, published Monday in Nature Geoscience, concluded that the decline in the Atlantic meridional overturning circulation (AMOC) from 2004 to 2014 was “part of decadal variability of the North Atlantic,” representing a recovery following a previous strengthening of its currents. Still, leading scientists warn that greenhouse gas pollution appears to be causing the circulation pattern to slow down, and that it will continue to do so with far-reaching implications for weather and for flood-prone cities and farms around the world..."
Can FEMA's Flood Insurace Program Afford Another Disaster? Blame Sandy and Katrina, and a litany of other flood-related disasters in recent years. 90% of all disasters in this country involve flooding. The hourlong documentary was extraordinary on PBS; here's an excerpt of a companion article from Frontline: "Floods cause more damage each year in the United States than any other kind of natural disaster — so much more, in fact, that most private insurance companies stopped offering flood insurance decades ago. In 1968, the federal government stepped in, creating the National Flood Insurance Program. The program is run today by the Federal Emergency Management Agency. Over the last 11 years, the program has fallen billions in debt; a 2015 report from the Government Accountability Office said it was unlikely to be able to repay the money it has borrowed from taxpayers. Worse yet, the program has been accused of waste, poor oversight and fraud..."
Emotions Seem To Be Detectable in Air. The Atlantic recently ran a fascinating story; here's an excerpt: "...In Hunger Games: Catching Fire, for example, during the “suspense” scenes—when Jennifer Lawrence was in particular danger—the carbon dioxide, acetone, and isoprene levels in the theater air predictably increased. The researchers speculate that this may have something to do with breath-holding, or stress hormone production—but it is all speculation. The important point was that the signals occurred at exactly the same time in all four screenings of the film. They also found the reproducible changes in the air chemistry during “humor” scenes in other films..."
Why You Will Marry The Wrong Person. Here's an excerpt of a little day-brightener from The New York Times: "...Indeed, marriage tends decisively to move us onto another, very different and more administrative plane, which perhaps unfolds in a suburban house, with a long commute and maddening children who kill the passion from which they emerged. The only ingredient in common is the partner. And that might have been the wrong ingredient to bottle. The good news is that it doesn’t matter if we find we have married the wrong person. We mustn’t abandon him or her, only the founding Romantic idea upon which the Western understanding of marriage has been based the last 250 years: that a perfect being exists who can meet all our needs and satisfy our every yearning..."
60 F. low temperature Monday morning. 84 F. high reported in the Twin Cities on Memorial Day. 73 F. average high on May 30. May 31, 1934: Extreme heat impacts the Twin Cities, with highs of 107 in St. Paul and 106 in Minneapolis. Rush City reached 110. Numerous cases of heat ailments affect people and livestock. May 31, 1932: A heat wave hits southern Minnesota, with highs of 108 at Campbell, Fairmont, Faribault, and New Ulm. Meteorologists Are Seeing Global Warming's Effect on the Weather. Here's an excerpt of a recent story I wrote for The Guardian: "...A warmer atmosphere is increasing water vapor levels overhead, juicing storms, fueling an increase in flash floods in the summer, and heavier winter snows along the East Coast of the USA. “All storms are 5 to 10 percent stronger in terms of heavy rainfall” explained Dr. Kevin Trenberth, at the National Center for Atmospheric Research in Boulder, Colorado. “It means what was a very rare event is now not quite so rare.” In recent decades, weather patterns have appeared to become more sluggish and erratic, worldwide. Rapid warming of the Arctic may be impacting the jet stream, the high-speed river of air that whisks weather systems around the planet. These high-altitude winds are powered by north-south temperature gradients, which are being altered by rapid warming of northern latitudes..."
This Week's Wild Weather, Brought To You By The Letter Omega. Following up on the preceeding story here's further explanation of how a variation in north-south temperature gradients may be impacting jet stream winds, worldwide, causing weather to become "stuck" with greater frequency - courtesy of WXshift: "...While blocks are a normal part of weather, there is some tentative evidence that blocking may become more common with climate change. The warming Arctic may be the key driver and is a reminder that what happens in the Arctic does not stay in the Arctic. Fundamentally, the speed of the jet stream depends on the contrast between the temperature in the tropics and the Arctic. 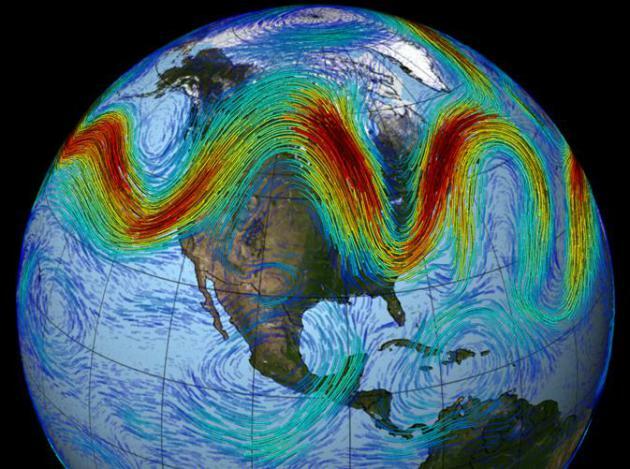 A larger temperature difference yields a faster jet stream. If the Arctic warms more quickly than the tropics, which has been observed, that temperature difference decreases and the jet stream slows. And as it does during its annual summer retreat, the slower jet stream tends to meander, leaving behind these large swirls responsible for atmospheric blocking. At the forefront of this research is Jennifer Francis at Rutgers University. And while the strength of this relationship that she has highlighted is still the cause of much discussion in scientific circles, a new study in the Journal of Climate lends support to the idea..."
A Walk in the Dead Woods. Here's an excerpt of an Op-Ed at The New York Times: "...The dead woods are a sad symptom of a larger planetary illness. Last year, more than 10 million acres burned in the United States — a record, consuming an area larger than Maryland. 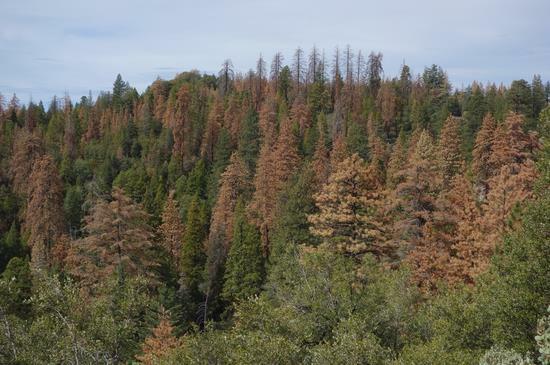 Fire seasons are nearly 80 days longer than they were in the 1970s, according to the Forest Service. “We keep setting records that we don’t want to see beat,” said Vilsack. We keep setting horrid heat records as well. In April, for the seventh straight month, global temperatures posted a new average monthly high. Roads have melted in India. A city in the northwest, Phalodi, posted the warmest day in India since records were kept: 123.8 degrees on May 19..."